Full disclosure here. 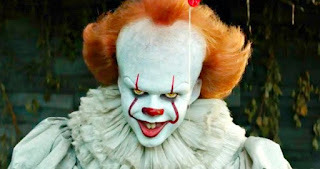 I knew NOTHING about the story of Stephen King's It until I saw this film. I totally missed the 1990 miniseries and didn't really read any reviews leading up to this feature film adaptation. Now I am well versed in the story of seven kids living in Derry, Maine who spend a Summer trying to ward off an evil force that manifests itself into both a killer clown and individual fears of each child it encounters. The story is definitely creepy and classic King, but from what I've seen of the 1990 miniseries, the film adaptation of It (directed by Andy Muschietti) is clearly the more accomplished page to screen translation. The real key to this film being a faithful adaptation and a watchable frightening experience, is the casting choices made by New Line Cinema. Bill Skarsgard (yes, another son of Stellan) plays Pennywise, the creepiest clown since Heath Ledger's Joker who can morph into a variety of nightmarish shapes and has the dental makeup of a great white shark. Appearing at various times throughout the film (usually proceeded by an ominous red balloon), Pennywise is the heart and soul of this horror tale and Skarsgard does a bang-up job by being equal parts jolly and terrifying. His performance is so much more nuanced and effective than Tim Curry's in the miniseries version. Another great casting coup for this film was made in the kid-actor department. Nearly all of the main seven child actors bring a sense of realism and authenticity to their roles. The highlights lie in Sophia Lillis (who plays Beverly), a young actress with natural beauty and an eerie likeness to what we all imagine Amy Adams looked like as a child. In-fact, after the film I found out Lillis is actually tapped to play a young Amy Adams in an upcoming HBO series. Lillis plays the lone female character among six other boys and does a great job with a difficult role that features parental abuse and elements of bullying. Finn Wolfhard also stood out to me as Ritchie (the comic relief character in King's novel). Wolfhard is one of the leads in Stranger Things (Season 2 coming soon to a streaming device near you) and embraces the ability to spew rated-R dialogue in this role. He delivers most of the quality laughs of this film and his delivery and cadence make him one of my favorite young actors working today. Speaking of the Netflix series, this film version of It is steeped in proper late 80's culture. We see a lot of movie references of the time, a Street Fighter stand-up video arcade machine and several 80's music references including a nicely placed New Kids on the Block poster. Taking a queue from Stranger Things, we seem to be getting a nice slice of 80's nostalgia and it's really a joy to take in as someone who grew up in that era. Overall, I really didn't find myself to be that "scared" by the film. There are definitely some creepy elements, but a lot of the "terror" seemed more cartoonish than disturbing. That's just a personal preference though. I know a lot of people will get genuinely scared by this movie. Some of the scares also got a bit repetitive as the film went on. There's a lot to like here though and the performance of Skarsgard, Wolfhard and the other talented kid actors clearly make up for some of the low points. It seems as if It will help resurrect the dying box office (this Summer has been a real letdown for Hollywood in terms of box office grosses). Like an emergency CPR maneuver, It ended up having a KILLER weekend, grossing $117 Million, the second highest weekend opening for an R-rated movie EVER. So it looks liek we're definitely going to see the Chapter 2 sequel that is teased at the end title of this movie. Go ahead and give this a watch in theaters, while not perfect it's a good horror film that will resonate with you for a while. A solid 4 out of 5 JRs for It, a nostalgic look at fear and youth with a wonderfully whimsical killer clown mixed in for good measure. 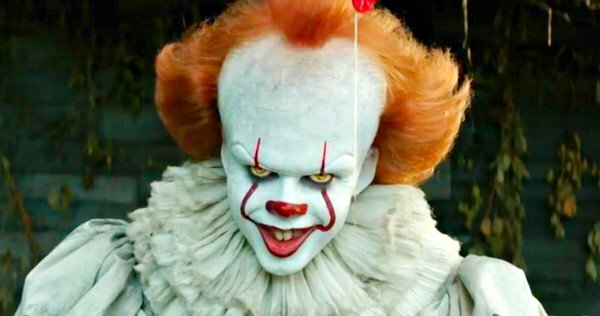 NOTE 1: With such a huge box office success, mark my word... Pennywise will be the #1 Halloween costume next month for boys/men age 14 - 40-something. NOTE 2: MoviePass is BACK. I had recently unsubscribed from the all-you-can-watch movie service a few months ago. The price went up as high as $50 per month. MoviePass recently dropped to an amazing $10 per month and if you see at least one movie a month usually, this should be a no-brainer purchase for you. Due to high demand, I still don't have my card yet, but once I get it, my movie watching frequency will ramp-up again.